You’ve probably experienced the anxiety of having a strange dog or person come up to your dog while you’re walking. 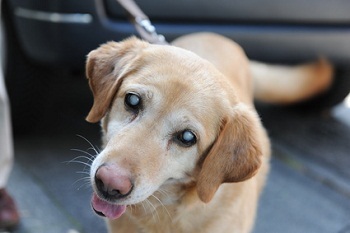 While in many situations, this might not be a problem, for blind dogs it might be stressful and startling. Blind dog collars and harnesses are a good way to signal to others that caution should be used when approaching your dog. 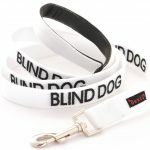 These blind dog collars feature a white background with “BLIND DOG” embroidered in bold black lettering. 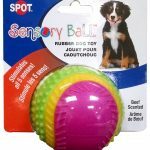 It notifies approaching people that your dog has limited or no sight, caution should be used, and space should be given. It is essentially a “white cane” for your dog and helps keep them safe. In addition to blind dog collars, there are leashes for blind dogs as well. 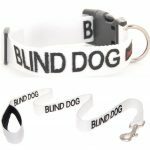 They also feature the words “BLIND DOG” embroidered and repeated along the length of the nylon leash. The words are on both sides, so approaching strangers can’t help but notice. This leash is 6 feet long, 1″ in width, and the letters are 3/4″ in width. The handle is nicely cushioned for your handling comfort. It’s durable and washable, just throw it into the washing machine. 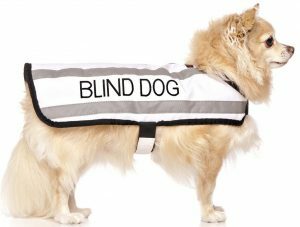 This blind dog coat does double duty by keeping your dog warm and warning others of your dog’s blindness. The coat is waterproof and fleece lined, as well. The fit is adjustable and there are coats available in sizes Small to X-tra Large. All of these products are currently rated 4 stars or higher by customers. 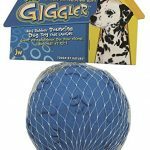 We hope they help make walks and social situations much easier and comfortable for your blind dog. If you have any of these products and would recommend them or know someone they would benefit, please share this post! Please subscribe to our Newsletter or leave a comment below.